Home Resources White paper: Post-2020 reform – status quo or seismic shift? White paper: Post-2020 reform – status quo or seismic shift? The Post-2020 reform sets the framework of the EU carbon market from 2021-2030. It contains several important provisions that are likely to have an impact on the market as early as 2018. The reform had been negotiated by European legislators for over two years before it was finally agreed in 2017. 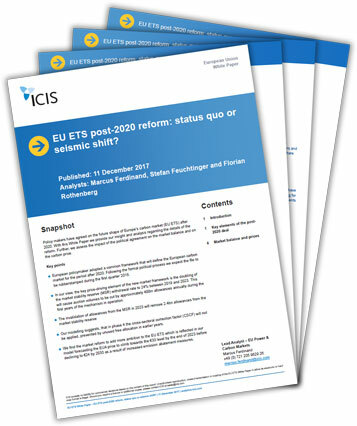 In this white paper, ICIS breaks down the impact this reform is likely to create on the EU market and how the EU carbon market is likely to develop over the next 10 years.